The Jewish holiday of Purim is rapidly approaching which means two things around here: a scramble for costumes and baking hamantashen. Hamantashen are the customary Purim treat for Jews of Eastern European origin. 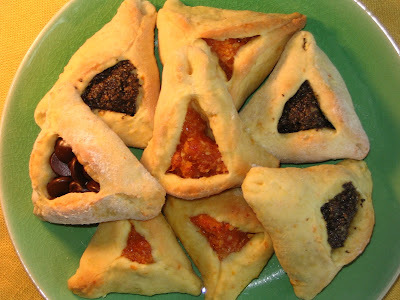 Triangular pastries enclosing tasty fillings, they are said to represent the pockets (or ears) of Haman, the evil villain in the Purim story. One thing I truly enjoy about living Jewishly is that time is marked in many ways, including through specific foods. Some have longstanding traditions behind them, others I've made traditional for our family. I only make latkes and doughnuts at Chanukah, I only have lemon curd at Passover, and I only make hamantashen at Purim. There are probably hundreds of recipes out there for hamantashen dough but I was lucky to find this one early on in my holiday baking experience. 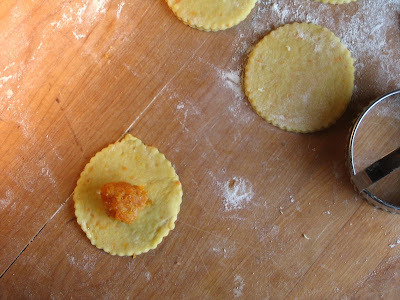 It's an easy dough, fragrant with the aroma of fresh orange which compliments traditional fillings perfectly. I've never had any reason to look at any of the other dough recipes because this one is delicious and a snap to make with a food processor. Many people fill their hamantashen with jam or even canned pie filling, both of which are too sweet for my tastes. I like to make fillings from poppyseeds, apricots, prunes, and, for the kids, there are always a few filled with bittersweet chocolate chips which go splendidly with the orange-scented dough. Filling recipes are here. Hamantashen are not the simplest thing to make. Admittedly, they're a bit fiddly and time-consuming. But for a once yearly treat, they're hard to beat.